Located at Barangay Buenavista, Hikdop Island, 45 minutes by pumpboat from the city is this enchanting cave. 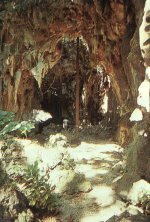 The interior stone formation depicts the illusionary image of a grand King's Court complete with inner chambers complemented by picturesque stalactites and stalagmites. The highlight of the journey down this cave is the knee-deep pond situated in one of its innermost caverns resembling a throne.